It is funny how the scripture is so often misused. Many times what is clear is obscured and what is unclear become codified as canonical law. Biases, preferences, culture and sin all attribute to misunderstanding the scripture. I think it is apparent that when any of these are in use, one could have trouble discerning the truth of the scripture. Each have constituent a need to make the scripture say a certain thing. No matter the motivation, the scripture is destined to be perverted by such. It needs a scientific mind. One that says “Come what may, we will have the truth in the end no matter how ugly or unbearable it may be.” Truth can only be discovered by such. Another to recognize is the difference between the Church and Israel. The Church is under the New Covenant of grace and Israel the Old Covenant of law. When you reach for Israel and the Old Covenant and pull it in to the Church you reform what Christ came to destroy. There are 613 laws of the Old Testament related to Israel. Do you really want to be burdened again by what Christ came to free us from? Paul states in Galatians 3:10 “All who rely on observing the law are under a curse, for it is written: “Cursed is everyone who does not continue to do everything written in the Book of the Law.” Clearly no one is justified before God by the law, because, “The righteous will live by faith.”” Can you see it faith that leads to obedience to love your neighbor as yourself. He says in Galatians 4:6 “Because you are sons, God sent the Spirit of his Son into our Hearts, the Spirit who calls out Abba, Father.” See it is a faith love thing! The New Covenant frees us from the Old Covenant law. “Everything is permissible, but not everything is beneficial. Everything is permissible, but not everything is constructive. Nobody should seek his own good, but the good of others” 1 Corinthians 10:23-24 Again it is a faith love thing generate by the Spirit of God! The New Covenant is one leading us to love that comes from Faith in Jesus, his person, work and mission, because of the hope of the resurrection. So, be guided by faith and the Holy Spirit that leads us to love. 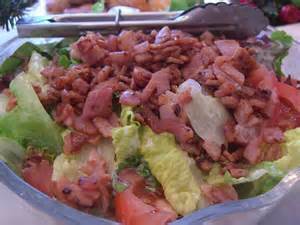 Now be free: Eat those bacon bits on your chef salad and don’t worry if it is kosher.